With all of the new forms of social media coming out these days, it seems like there is always a new ‘next big thing’. Well in this case, we really do believe that Pinterest will be the ‘Next Big Thing’ for the woodworking community, as it does a great job highlighting the often amazingly detailed visuals of woodworking that can be hard to get across in a medium like Twitter or Facebook. With that in mind, we are proud to unveil the new Highland Woodworking Pinterest page! Our page features many different boards, including those dedicated to tools and products that can help you DIY, as well as boards that feature work(s) that have been submitted by our customers and readers. Projects for the Kids: Whether it is one of our Woodman Concept Kits or one of our Red Toolbox Project Kits, we’ve got lots of ideas for the kids and the kids-at-heart to get started in woodworking. Show Us Your Workshop: A popular column in our Wood News monthly newsletter, these pins will give you inspiration for your own workshop with different designs and organization techniques. Tools to DIY: A collection of our favorite tools you can use to “Do-It-Yourself” and create your own woodworking project. 2013 Jig Design Contest: Occasionally, we have contests where readers and customers submit their own designs, and the most creative/useful win a Highland Woodworking Gift Certificate. Our most recent contest was our Shop Jig Design Contest, and this board includes details of every single submission! Woodworkers You Might Know: From Roy Underhill to Chris Schwarz, these pins will give you some great links to interviews and project ideas from the best of the best. DIY Project Ideas: We’ve got lots of ideas for you with our different Downloadable Plans, as well as other interesting and inspiring projects that you can create. Show Us Your Carving: Another popular section in our monthly Wood News, here you will find different carvings by our customers and readers. Show Us Your Stuff: Our most recent submission section, these pins will give you inspiration with projects made by our customers and readers, that vary from miniature furniture to John-Deere inspired chisel chests, and everything in between. 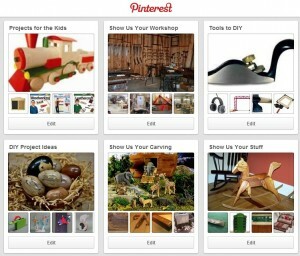 You can also use Pinterest to Pin your own ideas from various websites you may be browsing like Highland Woodworking. On our webpage, you will now see a small icon with a P (like the first image in this blog entry), which you can click and then pick the picture you want to pin from the webpage on to one of your own boards. This is a great tool for making wish-lists or a list of tools and methods you might need to create your project. Let us know if you have any suggestions or ideas for Pinterest boards you would like to see, and feel free to visit and follow our Pinterest page by CLICKING HERE and get inspired! Hi to all at HWW. Great to follow you on Pinterest.